USING THIS MODEL OF HOPPER CAR ON ANY OTHER SITES WITHOUT PERMISSION OF AUTHORS AND ADMINISTRATORS IS PROHIBITED! ATTENTION! 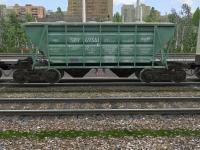 FOR CORRECT USING OF THIS HOPPER CAR YOU NEED TO DOWNLOAD SOUNDS #2 FOR FREIGHT CARS FROM THE SITE http://www.trainsim.ru! Hopper car adapted for use in OR and RTS.